The oil market has enough supply and prices are at a favourable level, Saudi Arabia's oil minister said on Tuesday, affirming the willingness of the world's top crude exporter to meet shortages. Saudi Arabia pumped oil at a record rate of more than 10 million barrels per day (bpd) in August, helping to cushion the market from the virtual shutdown of Libya's exports and reduced output from other countries including Nigeria and Iraq. "I'm always asked and have always answered, the market is in good condition. Supply is adequate, inventories are excellent ... Demand is being met," Saudi Oil Minister Ali al-Naimi told reporters after a Gulf Arab oil ministers' meeting. He reiterated that Saudi Arabia had an oil production capacity of 12.5 million bpd. "The kingdom always tries to meet a shortage for any reason. 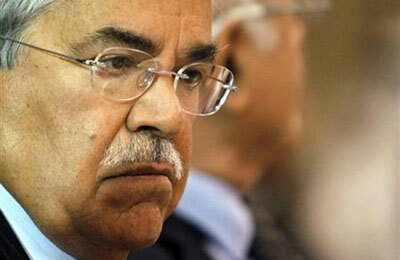 We did it in the past, we will do it in the future because we have capacity," Naimi said. Saudi Arabia favours an oil price of around $100 a barrel. Brent crude rose to above $117 in August on the loss of Libyan supply and the prospect of U.S. military action against Syria. The price has since come down and was trading below $108 on Tuesday as the threat of a U.S. strike on Syria had receded and on signs of Libyan output starting to recover. Kuwaiti Oil Minister Mustapha al-Shamali, also in Riyadh for the ministers' meeting, said he hopes his country can achieve oil production capacity of 4 million bpd by 2020. Kuwait's current production is 3.2 million bpd, Shamali told reporters. "God willing, Kuwait can reach 4 million bpd of capacity by 2020," he said. According to the latest Reuters Opec survey, Kuwait produced a record high of 2.85 million bpd in August and 3.2 million bpd would be 12 percent above that.